Yah, I know it sounds like the hit TV series Grey’s Anatomy. Actually, it’s a reality spin off program of Grey’s Anatomy backed by the production of CNN. Real doctors, patients, surgery and the not so interesting life of the resident doctors. I’m a fan of Grey’s Anatomy and I find this show amusing. I just pity the doctors with a 30-hour shift. There is such a 30-hour shift work without sleeping. Oh my! I pity them and at the same time, I admire their passion in medicine and their passion to help sick people. 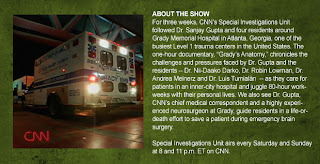 Visit www.cnn.com/gradysanatomy for more details of the show.